That we decided to stay put for the day! So I took Meg for a long walk instead. We did a circular route, taking in Tatenhill village and Battlestead Hill, which rises to 350 feet to the north of the canal. The hill is reputed to be the site of a skirmish between Angles and Danes. I hope they could see more than I could today…. 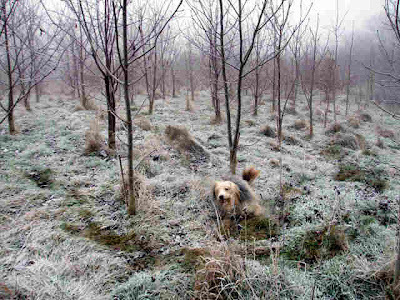 But we both enjoyed it, Meg loves charging through the snowy grass. 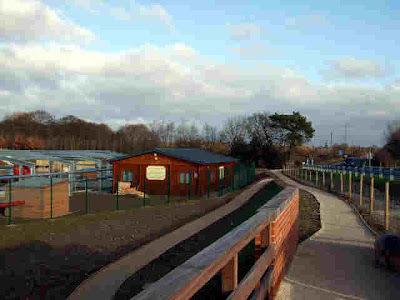 The walk is part of the "Monks and Moorings" circular footpath. Apart from me fitting a new light switch in the loo, we’ve had a lazy day, sitting reading. There’s been maybe half a dozen boats up and down the canal today, and we’ve a Canaltime boat moored up behind us tonight. Even though it’s been cold all day, there’s not a hint of ice on the water. 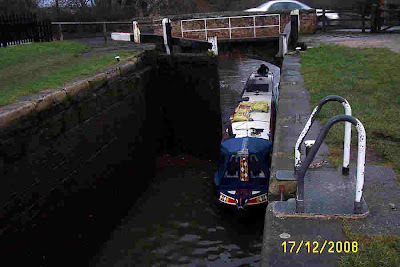 Maybe this navigation flows enough, down through the locks, to keep it clear. Or maybe it’s just not as cold as it was at Kilby Bridge earlier in the month. Well, it’s New Year’s Eve. It’s not been a bad year all told, but indications are that 2009 will be one to remember, and probably not fondly. Ah well, we’ll just have to see…..
Eeh it’s good to be on the move again. 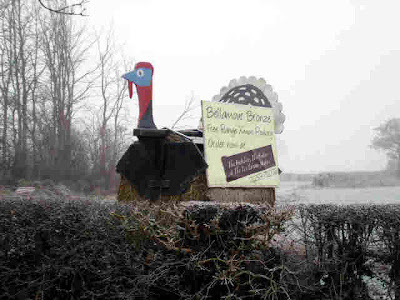 But our Christmas lay-over at Willington has made me a bit soft. Even though the thermometer was laying just on the right side of 0°C, I was bl**dy frozen on the aft deck today! I’ll have to get acclimatised again. 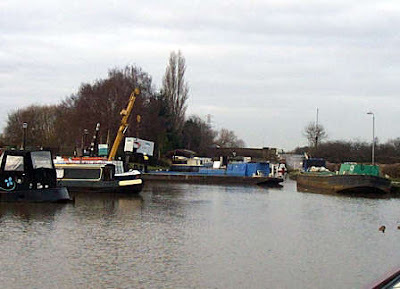 Eggington Long Term Moorings, with handy access from the A50. A bit too handy really. You can see it, just the other side of the hedge… And it’s a fast dual carriageway. 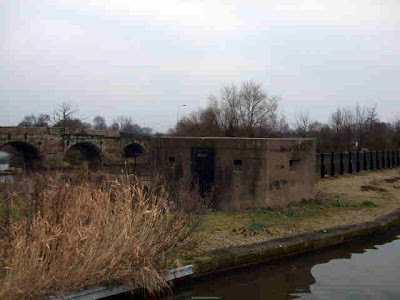 A WWII pill box guards the crossing of the River Dove. 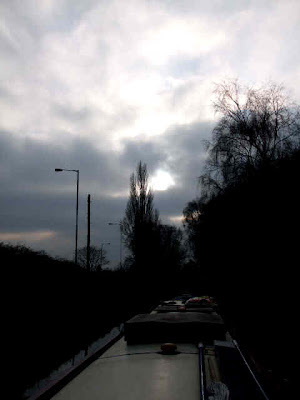 It’s been a grey nondescript sort of day, with the sun just the odd phantom of a disc showing through the cloud. 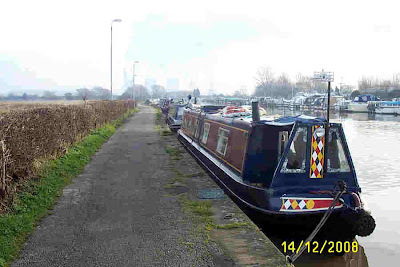 I was glad to get to Dallow Lock, in Burton on Trent, to get some exercise and get the blood moving again. 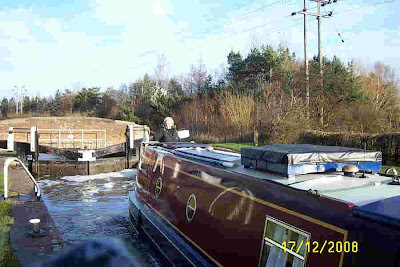 This is the first narrow lock on the Trent and Mersey in this direction, and the first we’ve passed since coming down the Foxton flight back in late November. The next stop was intended to be Jannel Cruisers at Shobnell for solid fuel, but the place is all shut up. They’re having an extended holiday, opening up again in the New Year. 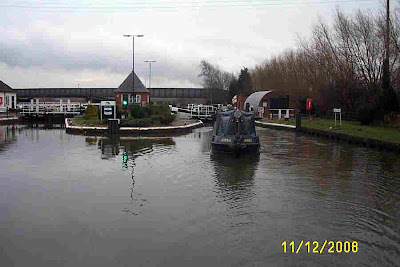 So we pushed on, out of Burton past the new warehousing units that have sprung up since we last passed, through Branston Lock and called it a day just east of Branston Bridge. It’s been surprisingly busy on the water today. Well, I was surprised, anyway. 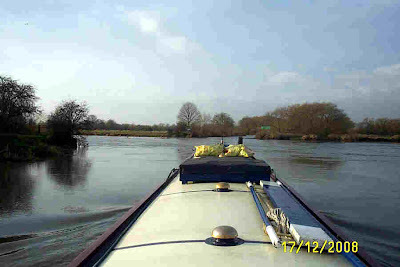 We followed 2 other boats out of the marina, and another was behind us but turned towards Stenson. And I counted 16 others coming down the canal. 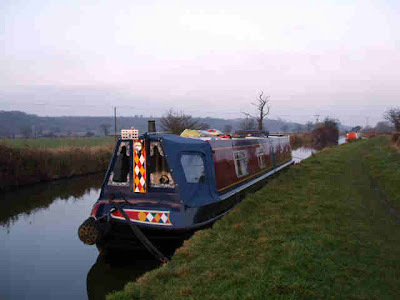 The vast majority were rentals, Canaltime from Sawley and Shakespeare Line from Barton Turns. 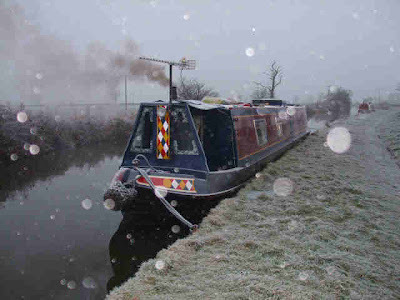 It takes a bit of optimism to plan a boating holiday at this time of year. 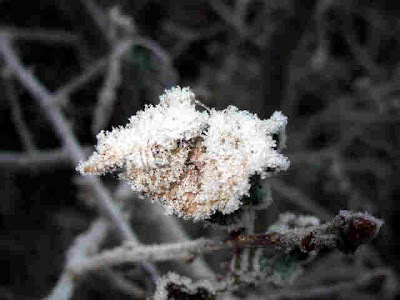 The weather could be anything from warm and sunny to frozen solid! 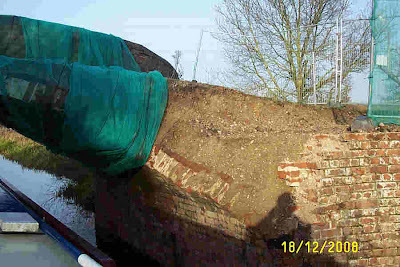 Having failed to “bunker” at Jannel, I rang the local coalman at Fradley, to see when he is delivering there. It’s over a year since we last had a shipment, and Ray has retired, but the business still continues, and we’ve arranged for a delivery next Wednesday. It’ll be handy because I can organise a Tesco delivery at the same time. So now we’ve got a week to kill. 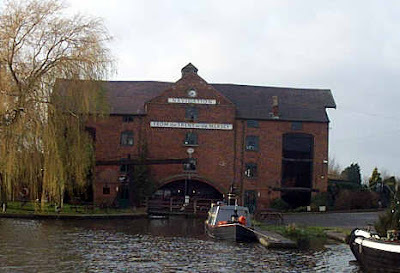 It’s only about 6 hours to Fradley. We’ll probably go down the Coventry for a bit. There’s some pleasant walks around Hopwas Wood…..
Well, that’s another season gone of joy and merriment, of stuffing yourself too full with food and drink, and trying to decide what to do with the obscure gift you got from Aunty Maud, who still thinks you’re 10 years old. I hope you all had a good time, with Santa bringing you everything you wanted (but not necessarily needed!). 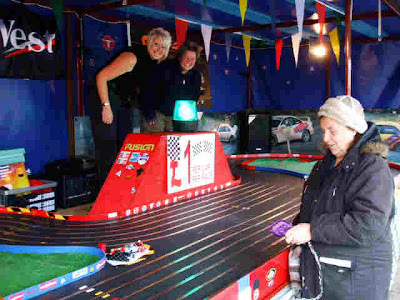 Last Sunday (the 21st) we went up to a place near Ashbourne to meet Carol and Sonja, who were up there with their mobile race track at a fund raiser for a dog’s home. Bare Arms! She's tough, that Sonja! 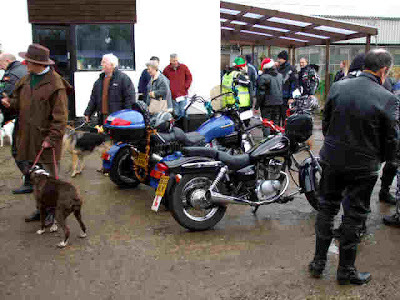 A local motorcycle club have a run out, finishing up at the kennels and bringing gifts of dog food. Just For Dogs has a good reputation in the area, so if you’re looking for a canine companion you could do worse than give them a call. We did very well this year, being invited out on Tuesday, Christmas Day and Boxing Day, so we had to do hardly any cooking ourselves. In fact, with the trip we made up to Yorkshire on Monday, where we were fed by good friends Val and Johnny, I don’t think the oven went on until yesterday! So thanks to Kay and Paul, Dad and Ann and Andy and Nyree, as well as the aforementioned Val and Johnny, for making sure we had a Christmas to remember. We had a surprise visitor yesterday. One of Margaret’s sons, Howard, lives in Ireland, and had told everyone he was having a quiet time over there. All the while he was secretly planning to fly across and drop in unexpectedly on the family. I was the only one pre-warned; he had to tell me to find out where we were! Everyone else live normal, housebound lives, and could be reckoned to be where expected. Margaret was well chuffed, we hadn’t seen him for over year. So he had a hectic time, flying into Liverpool, driving up to Ingleton, then Middlesborough, then down to us. Stopped overnight with us, then off again this morning up to Manchester and then Cleavelys, before catching a flight back across the Irish Sea on Thursday. I think he’ll need another few day’s holiday afterwards to recover! We’re going to be leaving Mercia tomorrow, intending to spend New Year’s Eve out in the sticks somewhere. We’ll let the new year in with just the three of us. 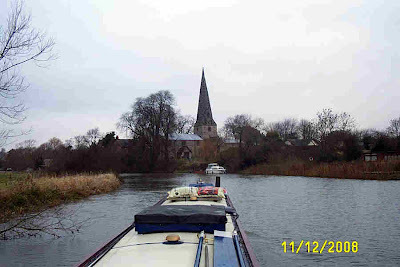 It’s been a good stay here in Willington, even though we’ve not spent a lot of it on the boat. The facilities are comprehensive and clean, and someone was round filling in the potholes in the road at the weekend! We’ve taken advantage of the laundry to get all the bedding washed and dried, and will be filling and emptying respective tanks before we leave. 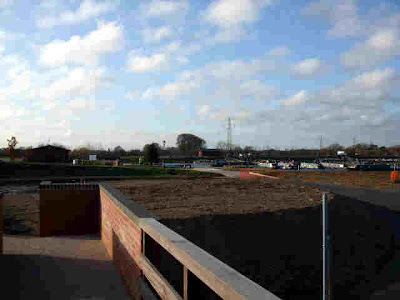 More shots of Mercia, taken from the footbridge over the entrance channel, and panning West to East. I should be back to posting regularly again now that we’re going to be on the move again. Just a couple of miles yesterday, and no locks. Up to Willington, under Bridge 20, the casualty of the farm trailer accident in October. It’s looking pretty sad, even though it’s gift wrapped in fetching green netting. 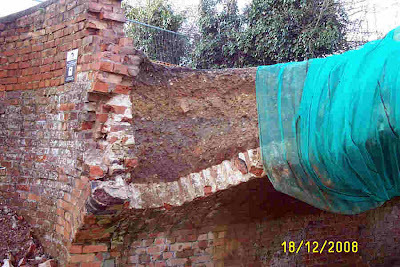 The decision has yet to be made whether to repair of demolish it. 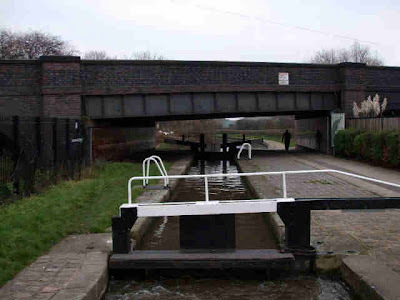 Like a lot of canal structures, this is listed, which may (or may not!) affect the outcome. 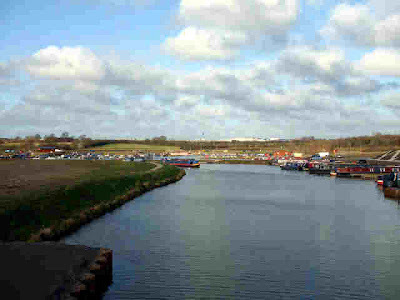 Into Willington to the services, then winding and back to the marina took about an hour. I booked in, and we were berthed on our pontoon by about 12:00. 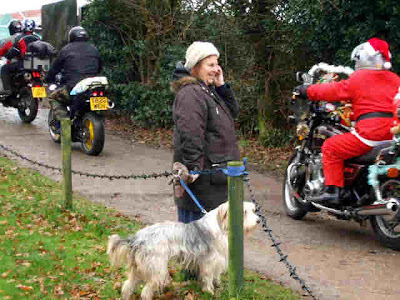 We had a pleasant welcome, the charge is reasonable, and the natives, both human and canine, friendly. 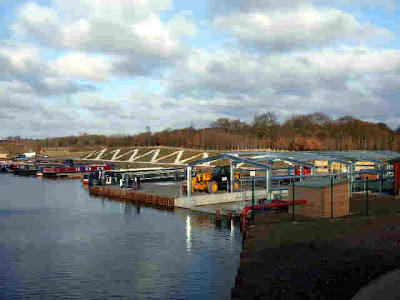 First impressions - the layout is good, built to blend with the landscape, rather than as a high-density boat park. Facilities are fine, 3 well equipped blocks are spaced around the perimeter, as are car parking areas. Security is maintained by gates activated by an electronic “key”. On the downside, the perimeter road is poor, and the open areas still look “raw”. I’m sure these are things that will be addressed in the fullness of time, as the site develops. A couple of truckloads of quarry bottoms in the pot-holes as an interim measure wouldn’t go amiss, though! We are planning to be here till after the Christmas period, moving out in the hiatus between then and New Year. 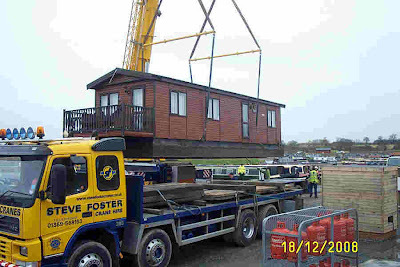 Shortly after we moored we watched the arrival of a floating chalet, craned in and towed into position nearer the office. 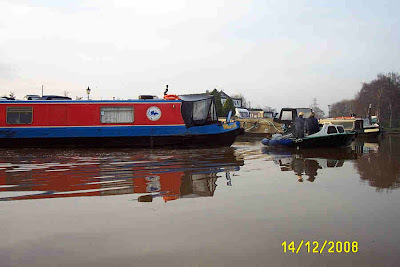 Two narrowboats pressed into use as tugs. Then I went and picked up a car from our usual source, Enterprise, and we’ve been shopping today. Got most of the pressies, but there’s still a way to go yet. I’ve got my good camera back, so will post some decent pictures of the marina later (if this damn rain stops!). The Trent goes down, we go up…. Up around 70 feet in fact. After a steady few days, watching the flood level markers on the locksides barely moving, the last 36 hours saw the river drop 2½ feet. This morning the flood lock indicator was just on amber, “navigable with care”, so that’s just what we did. But first we had to wait while the BW crew, who’d been busy over last weekend finishing Derwent Mouth Lock, unloaded some of the plant they’d floated down to the cut yesterday afternoon. Unloading generator sets and the like at Sawley. 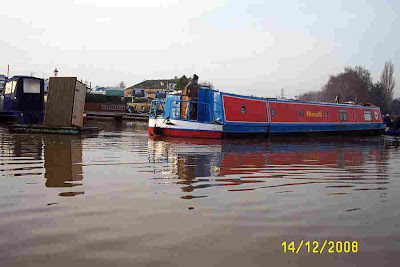 Then it was across to the marina ourselves to fill up with diesel. We had a “negotiation” over the declaration of my usage splits, which ended up with me getting the decision I wanted, albeit with separate invoices for propulsion and domestic fuel. 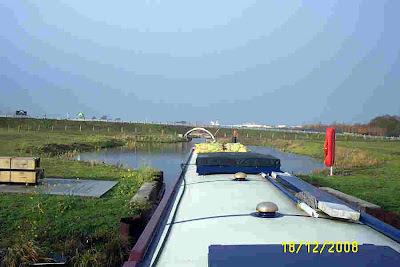 Then, with the roof also topped up with smokeless fuel, we went the short distance through the flood lock, which took us up onto the Trent. 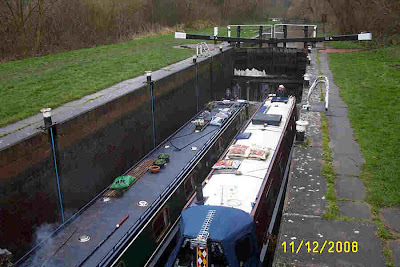 We didn’t need to close up after us, instead leaving the lock ready for Graham and Jennifer the couple on NB Best O Mates, heading down from Shardlow. 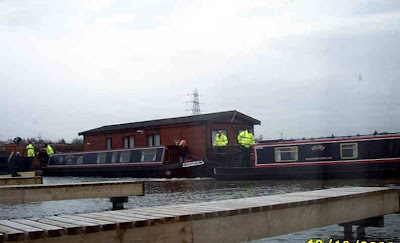 We met them yesterday, having cycled down to have a look at water levels at Sawley. And across Derwent Mouth. A lot calmer than recently…. Derwent Mouth Lock is the first on the Trent and Mersey Canal, sporting it’s brand new bottom gates! 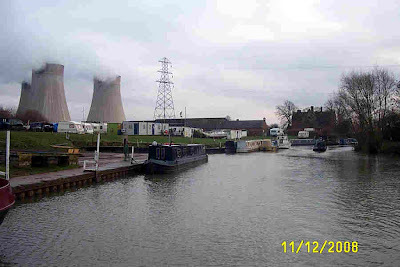 Through Shardlow and out into the country, following the Trent valley, we rose through the remaining 5 locks to Stenson. 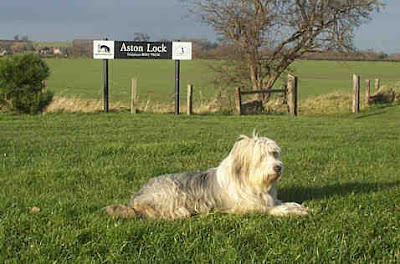 The locks get progressively deeper as the canal heads west, the last broad lock being Stenson Lock, with a rise of over 12 feet. 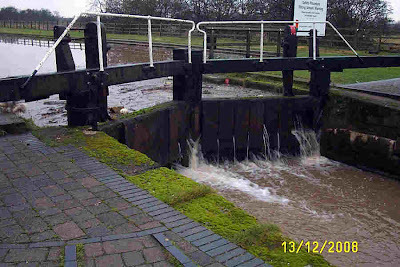 We’d intended to share these locks with No Problem, but with the flooded river scuppering the timetable, we’d left them at Sawley. 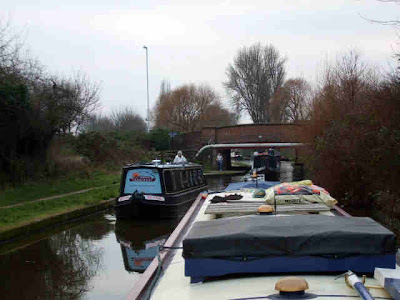 We stopped just above the lock at Stenson, and will finish the trip to Willington in the morning. 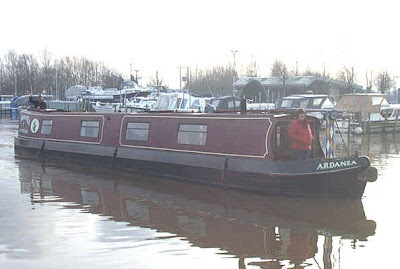 We’ve got the boat booked in to Mercia Marina for the Christmas period, to give us a secure base from which to do the obligatory visits. It’s been a fair day, overcast but not too cold. We’ve had no rain on route, but the forecasted showers have started now. I bet the flood indicators at Sawley are heading back into the red! 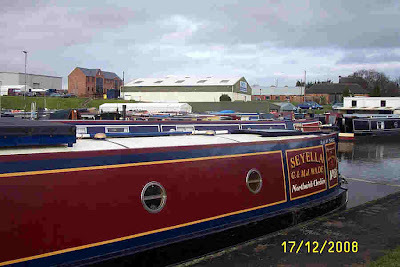 Well after a few days of travelling to get to Sawley, it’s now a few days of inactivity! On Friday night the weather front arrived as predicted, bringing quite a bit of rain with it. The wet weather continued through most of Saturday. 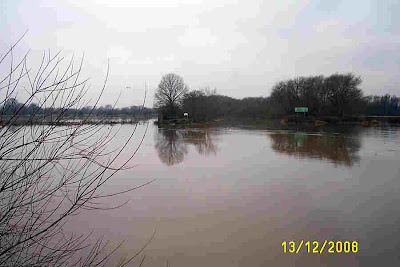 By the evening the Trent was up a couple of feet, and by yesterday morning had peaked at around 2’6” above it’s level when we arrived. 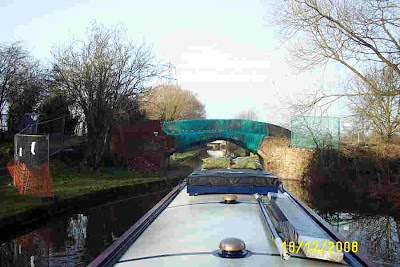 So it’s now well into the red zone on the markers, both above and below Sawley Cut. Derwent Mouth, the channel to the Trent and Mersey is straight across. BW continued to work on Derwent Mouth Lock over the weekend, but with the river as it is, no-one will be using it even if it is finished today. So we’ve (Sue and I and the dogs) have had a few longish walks in the area, giving me the chance to play with my GPS. Although on Saturday I thought that I’d broken it already! Plugging the cable in to link it to my laptop, the socket on the PDA disappeared into the unit. Stripping it down I found that the connector strip for the plug had come away from it’s housing, breaking the connections to the circuit board. 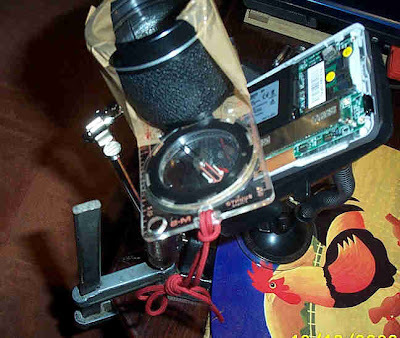 But with the aid of a jury rigged microscope and judicious use of Araldite, I got it back together, as good as new. It’s really pretty useful, knowing exactly where you are on a walk. I just download an area of a 1:50,000 OS map from my laptop, and the PDA does the rest. The water is going back down this morning, but a lot slower than it came up! It looks like we may be here for another couple of days. Still, we’re in no hurry, though I’d like to get to Willington before the weekend. Sue and Vic on No Problem are having to make contingency plans. 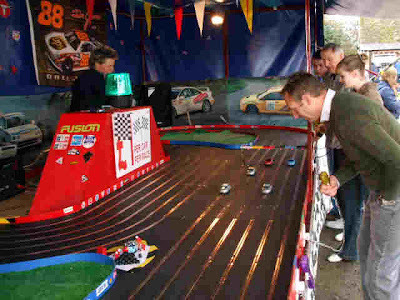 They were intending to be at Great Haywood by the weekend, 3-4 days travelling away. That’s probably not going to be possible, now. Which was, in turn, towing a raft supporting – a garden shed! He was towed onto the pump-out berth, and then to fill with diesel. That was the problem; he was heading out of the marina to the services when he ran out. He called the guys out from the workshop for assistance. Don’t know where the shed comes in, though! A short while later NB Ardanza came out, also for a pump out. We had the chance for a chat while they (Mark and Jean) waited. 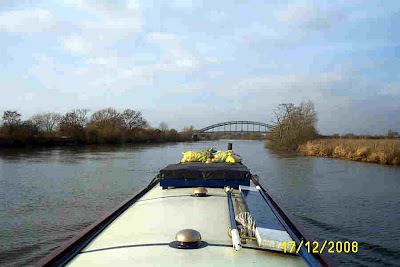 We’ve met them a couple of times before, on the Weaver and at Swarkestone. 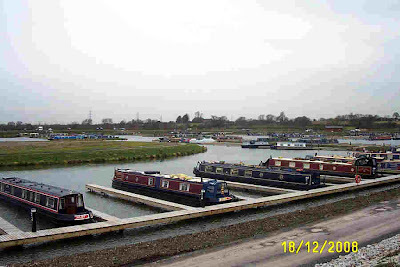 They berth their boat here at Sawley. An interesting sight on one of our walks. 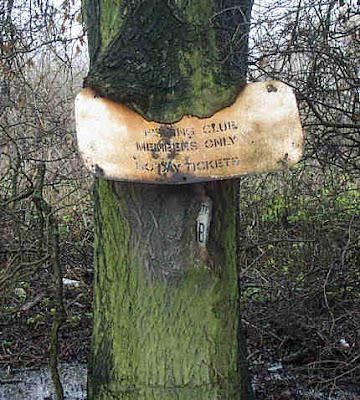 Two signs, which have obviously been there a while, being digested by a tree! 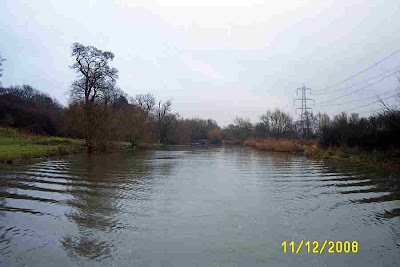 The Upper Trent is currently in flood and high water levels mean that the river is unsuitable for boats. Flood gates are on at Cranfleet and Newark. And a bit of good news. Just had a phone call from Dad to say that my camera has arrived back from Fuji after being repaired. That’s very good service. I sent it to them on Wednesday, and it’s sorted out and back the following Monday. Wow! The Long and Winding (Road) River..
We had an enjoyable afternoon yesterday, Dad and Ann came over to see us, and bring some bits and pieces that I’d bought and had sent to their home. So yesterday evening I set about installing 2x1Gb memory modules in my laptop. One turned out to be faulty, so it’s got to go back. Then it was time to play with the PDA I’d bought on ebay. Got everything I wanted installed, but Sue had to help me this afternoon to get the GPS bit configured. No excuse for getting lost now! 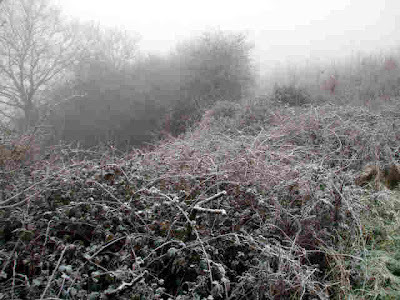 Another cold, frosty night gave way to a grey, murky morning, with damp in the air. Showers before we set off at 09:00 made hard surfaces slippery, requiring careful footwork on locksides. But as the temperature rose the ice thawed, making it much safer. In fact, the day wasn’t too bad at all. Grey all day, with odd spits of rain, but fairly mild. and they were true to it’s name. 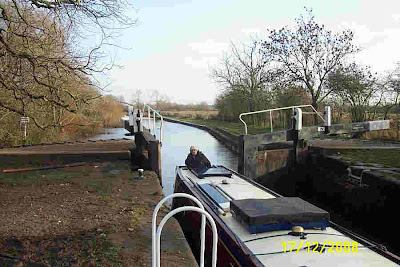 Each lock we came had either gate paddles or gates left open, orWe set off about ½ an hour after a hire boat heading back to Redhill. The boat was Lazydayz, even both. 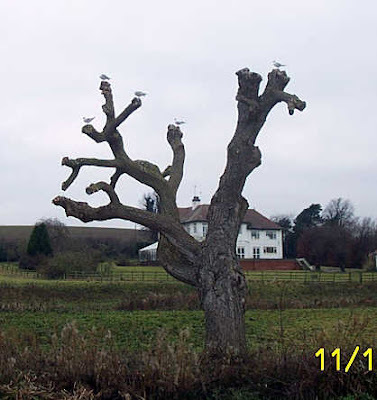 We passed them at Zouch, so at least got past that irritation. 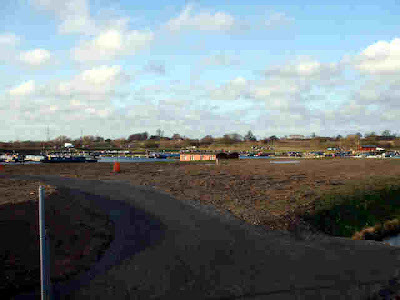 Redhill Marina, site of next year’s IWA National Festival. 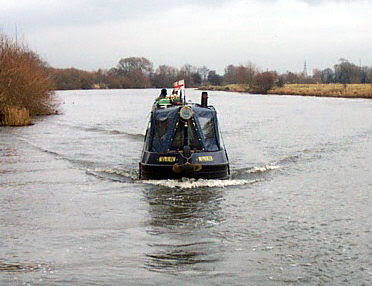 Down the remainder of the Soar and out onto the Trent, the change in direction of the river flow was immediately apparent. Pushing against the flow is a lot harder than going with it! 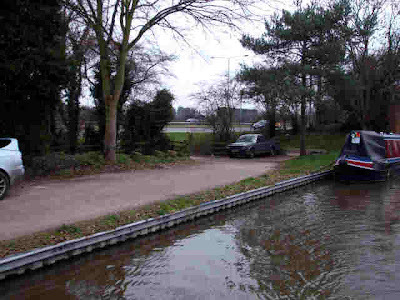 Up Sawley Lock, the easy push button operation being welcome after handling the heavy gates of the Soar's broad locks, and then along Sawley cut to moor opposite the marina entrance. Out of Sawley Locks. 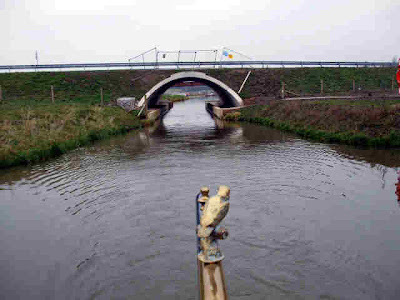 Note the traffic light, indicating that it’s safe to use the locks. This has been the longest day either of the boats has done for quite a while, but we can sit back and relax now, and hope that BW get Derwent Mouth Lock finished as planned for re-opening on Monday. We wanted to get here, off the rivers, because the weather is turning wet over the weekend and we didn’t relish being stuck with the water rising. 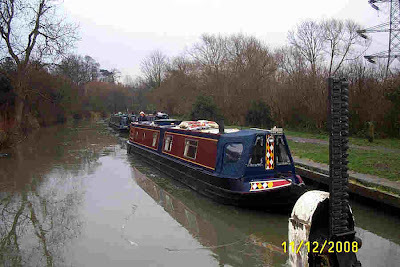 Frozen at Kilby, wet at Aylestone. Another cracking day, onward to Kilby Bridge.